On February 19, 2019, Bernie Sanders announced that he was putting his hat in the race for President in 2020, and within 24 hours he raised $6 million in small dollar donations. Within the week, he reached his goal of signing up 1 million volunteers around the country. Here's what you can do to get… Continue reading Gearing up for Bernie 2020! Proud of our work in 2017-2018! 2019 – here we come! We grew from 0 - 250+ members. 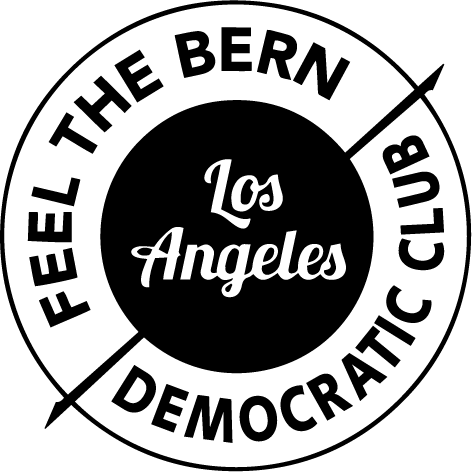 We’ve endorsed 17 corporate-free progressive candidates--and zero that weren't.See list of endorsements We supported progressive causes and organizations like NoOlympics LA, #SheDoes, SB562, Recall Rendon, Alhambran’s Campaign Finance Reform (which is headed to the 2020 ballot), the Bernie Sanders Brigade, citizen journalists like the Convo Couch and… Continue reading Proud of our work in 2017-2018! 2019 – here we come! Ringing in a Corporate-Free New Year! On December 27, 2018, in a boldly historic move, Feel the Bern voted to go Corporate Free! Whereas money is not speech, corporations are not people, and people must always come before profits, I, the undersigned candidate, do hereby pledge my allegiance to the People, not corporations What does that mean? Candidates who come to… Continue reading Ringing in a Corporate-Free New Year!